Muffins are great because they are easy to make and great for every occasion. These Breakfast Muffins are vegan, glutenfree and sugar free. To make them a little sweeter I added a lot of Datemousse. 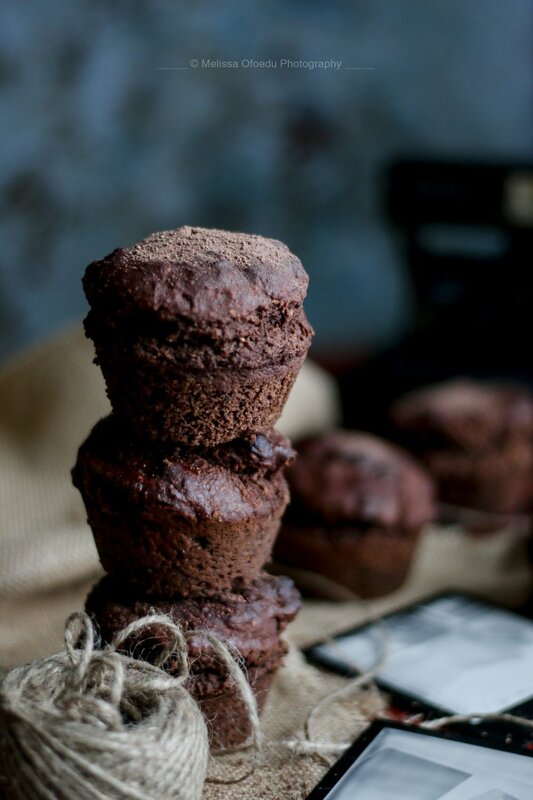 This Muffin is similar to the recipe I posted two weeks ago but more for those of you that love chocolate. I guess I might have to call this Blog the Chocolate Point of View, sicne I post quite a lot of Chocolate themed recipes but hey can you blame me. Chocolate is great when it comes to backing. While the last Breakfast Muffins I made were a lot drier, these wans are very fluffy and moist. I used raw & vegan Cacao because it has no added sugars, Milk or anything else that could simply destroy the purpose of these breakfast muffins. I wanted to make something that you can eat any time, after a workout, as a sweet treat when your on a diet or any time in between. Most cacao brands are unfortunatley mixtures made up of raw cacao, sugar and milkpowder. These dont really qualify as vegan, which I didnt really know for a long time. The Bananas and the vegan egg act as an activating agent. However if you dont have vegan egg powder at home I recommend using about 3 Tablespoons of Ricemilk. If have tried both and it worked out really well both times. Another great feature of these Muffins is the fact that they are done super fast. It takes about 20 Minutes in the oven and they can be keept for about 1 Week in a closed of container. I hope you enjoy the recipe and have fun backing.